The quality of pear demos means a lot to Pear Bureau Northwest. With direct access to pear consumers, a well-trained demonstrator can influence opinions about pears. The USA Pears sampling program supports each demonstrator with simple and fun resources. 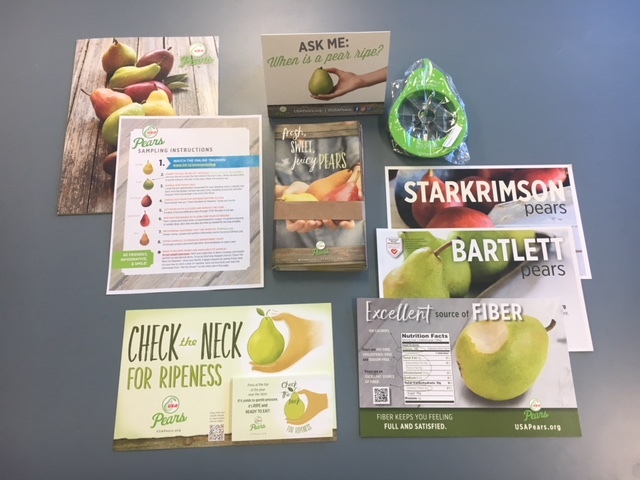 We are here to support retailers and demo agency staff in making each pear demo a great success with training videos, instructions, downloadable materials and more. How to tell when a Pear is Ripe: Check the neck for ripeness by gently pressing the neck or stem end of the pear. If it feels soft, then it is ripe, sweet and juicy. If it feels firm, store the pear at room temperature to ripen. Pears are one of the few fruits that ripen after they’re picked, like a banana or a avocado. Most pear varieties show little color change as they ripen. That’s why it’s important to check the neck for ripeness. Demonstrate checking the neck to consumers on ripe versus unripe pears. How to Ripen Pears: Pears purchased in the store often need to be ripened at home. Simply keep pears at room temperature, checking the neck for ripeness each day until ripe. Once they are ripe, place them in the refrigerator to slow further ripening for up to 5 days. Only refrigerate pears to slow their ripening and keep them firm and crisp. Pears are an excellent snack or simple meal choice. Try pairing them with almond butter, yogurt, cheese or even cured meats (like ham or salami) for easy, delectable results. Pears are an excellent source of dietary fiber (one medium sized pear provides 24% of the daily recommended value) and a good source of vitamin C (provides 10% of the daily recommended value). Pears contain no saturated fat, sodium or cholesterol. A medium pear has 100 calories and pears are suitable for vegetarian, vegan and gluten free diets.